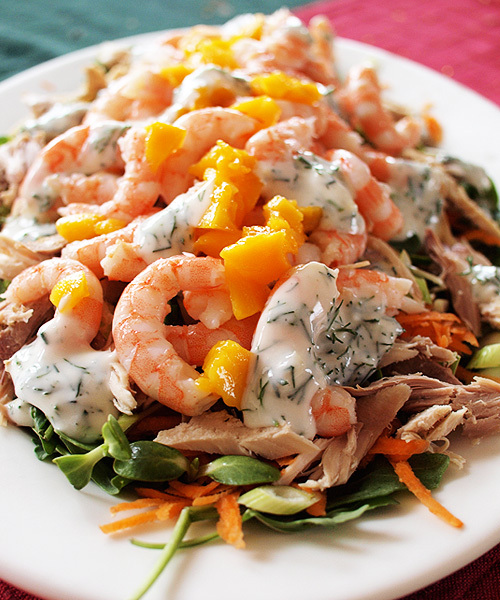 Turkey, prawn and mango salad: making leftovers posh! This dish is to support National Leftovers Day 2009 and uses ingredients from our hybrid Aussie-British Christmas dinner. I love the way it’s uniquely Australian due to the addition of fresh prawns and sweet mango flesh. Apparently Australians spend an estimated $7.6 billion on food in December, which is a huge amount, especially as a lot of it is wasted. Unused food that goes into landfill produces methane as it rots which is very harmful to our environment and contributes to climate change, a phrase which you’ve probably heard quite a lot recently. Sorry to get all hot and heavy on you the day after Xmas, but I think it’s a really important cause. Re-using, re-cycling and portion controlling our food is something we should be thinking about all year long. When I temporarily lived in the UK I was a strong advocate of the Love Food, Hate Waste campaign which is the British equivalent of the Aussie Do Something action group, founded by Jon Dee (who is also the founder of Planet Ark). Now, because I know you’re interested…. National Leftovers Day: Do Something! I really hope you enjoy this salad recipe and also that it inspires you to cook with leftovers today on Boxing Day, as well as make the most of odds and ends in your fridge all year long. A little bit of planning and a dash of creativity can go a long way for saving our beautiful planet, not to mention keeping our bodies and families healthy and happy! Next up it’s time to make New Year’s resolutions… have you thought of yours yet? Give me a ‘thumbs up’ on STUMBLEUPON. This salad also tastes great with shredded chicken so you’ve got no excuse not to make it any day of the year! Use leftover BBQ chicken or Chinese roast duck to make it even easier on yourself. 1. On a large platter, layer up the salad ingredients in the order they are listed, starting with the salad leaves and finishing with mango. 2. In a small bowl whisk together the tartare sauce, yoghurt, lemon juice and dill until well combined. Thin with a little water if it’s too thick. 3. Dollop the dressing over the salad and serve the rest on the side for your guests to help themselves. Serve also with boiled or leftover roasted potatoes to make a complete meal. Hi to you all – its great to be online here in Denmark and read all about your christmas meal. What a great campaign and def a great salad Christie! I’m having a lazy day today…and this weather is not really helping. We are having a huge roast beef pot roast with winter root vegetables and the leftovers from Christmas lunch: a melange of garlic-y Green Beans, Califlower, and Peas, the rest of a bottle of wine, and hot house tomato in the sauce. Adding a rosemary branch off the kitchen’s rosemary Christmas tree for seasoning and having a lovely fire. Tonight we will play the board games The Game of Life, and the who-done-it Clue after dinner.Tomorrow we plan to walk over The Hudson River at Poukeepsie on the new longest pedestrian bridge in the world… to work it all off and to get some fresh winter air. There will be leftover homemade chocolate cake for desert. Your feast sounds amazing! Can’t wait to see the pics! That looks like a stunning way to eat leftovers! Reducing leftovers is an important cause to support, and good luck with the tupperware. Great idea. It doesn’t look like it uses leftovers – and I guess that’s the best bit! I am always eating leftovers, I find it certainly helps with time and dishes, as well as being more environmentally friendly. YUM – The mango really takes the prawns to the next level!